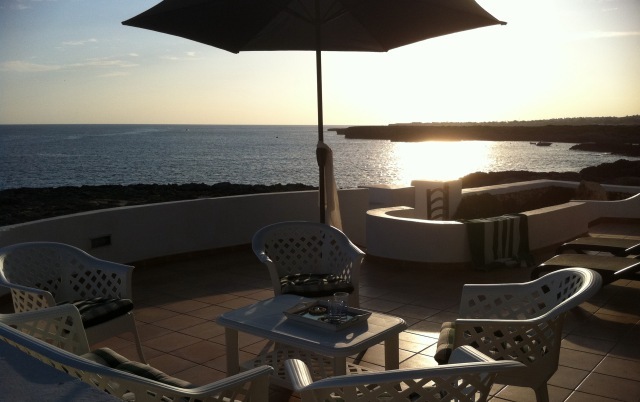 Mar y Caleta is a house built in 1970 and completely renovated in 2009. The house is set on a 450 square meter plot overlooking the sea, with a garden area, two terraces and a backyard. The living area has 165 square meters. The house has a spacious circle-shaped sitting-room/dining room, overlooking the sea, a fully-equipped kitchen and four double bedrooms, two of which have en-suite bathrooms. There is another full bathroom to be shared by the other two bedrooms. The house can accommodate up to 8 people. An additional bed and cot are also available, if required. The house has a superb air conditioning/heating system that works through a heat pump and provides a pleasant temperature at any time of the year. The pipe system does not affect the aesthetics of the house. The air conditioning/heating system is divided in three areas, thus temperature in the bedrooms, sitting-room and kitchen can be adjusted independently. There is a log fireplace in the sitting-room for the winter and a BBQ in the terrace to enjoy the good weather with a nice open-air meal. The kitchen is equipped with anything you may need during your stay: ceramic hob, oven, dishwasher, washing machine, two refrigerators, microwave and all kind of small electric appliances. Electrical heaters provide hot water. There is spray watering system for the garden and for the patio flowerpots. The house has TV, satellite channels (Digital Plus Total), Video, DVD, and a Home Cinema in the sitting-room. All bedrooms have their own TV set. Its location allows for fast connections by air with the main European cities. As there are no long distances in Menorca, you will be able to travel all over the island, enjoying its beautiful landscapes, its numerous monuments and cultural attractions. The house is situated in Binibeca Vell, a small fishing village adapted to tourism. There is a distance of 500 meters to the beach and is within less than a 5 minute walk to the village shopping area (which has supermarkets, restaurants, bars, cash dispensers and chemists). Mar y Caleta is situated within 5 km of San Luis (the closest town), 8 km of Mahón and 10 km of the Menorca airport. We have another house in the centre of Mahón. A unique property built on the city wall with astonishing views to the Mahón Port.